i have a jvc radio with remote has the usb, and aux connection only used for two months great condition and 100 for it. 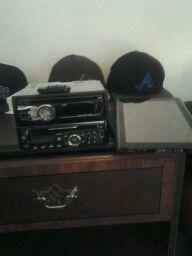 and i have a dual radio also has usb and aux, connection with Bluetooth brand new never been used asking a 100 for it also. have a acer A500 tablet 16gb for sale for 400 payed 700 trying to make money back off it. its brand new never used has a hard case with it.